How to Recover MDF File Contents after SQL Server Corruption? After you encounter any such errors, it means that your SQL database has got corrupted and you need to look for SQL MDF file recovery tool immediately to restart normal functioning of various SQL dependant operations in your organization. Normally in such error situations, you might fail to access your SQL Server MDF files. However, it is possible to recover SQL master database and to recover data from MDF file using an efficient SQL MDF database recovery tool. One such powerful yet convenient to use MDF file recovery tool is SysTools SQL Recovery software that performs efficient MDF recovery. 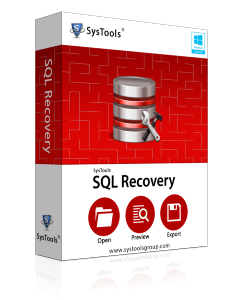 Another benefit of associating with SysTools is that you can avail the facility of the FREE Demo Version of our products including SQL Recovery software which will gives you an idea about the product performance before its purchase. With the help of this Demo Version, you can repair MDF files, see the MDF file recovery process but you cannot save the recovered contents to your system. For saving the files, you need the Full Version. Using SysTools SQL Recovery tool, you can recover MDF file items from corrupt SQL database in exactly original shape as present initially. Using this MDF file recovery tool, you can recover corrupted tables, databases, triggers, views, stored procedures easily. You can recover SQL database constrains and indexes. You can also recover database rules, checks, default values, objects and user defined data types. You can repair even large sized databases of SQL Server quickly. You can recover damaged primary keys, unique keys & foreign keys. Software supports SQL Server 2000, 2005 and 2008. SysTools SQL Recovery software runs with Windows 7 also. How to Recover Data from MDF File Seamlessly? Many users think that using any database recovery software would alter/delete/damage their data and it is impossible to recover data in its original form. SysTools software products ensure seamless recovery. Our SQL Recovery software repairs corrupt MDF files and recovers original data initially present with no alteration/damage/deletion of data information. Our software also recovers data from MDF file even if MS SQL Server is in "suspect" mode.